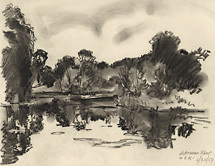 Untitled (Landscape with Lake)- 1959, Charcoal. Signed, dated and annotated to EM- 6/20/59 in pencil, bottom right. Image size 8 1/4 x 10 7/8 inches (209 x 276 mm); sheet size 8 3/4 x 11 5/8 inches (222 x 295 mm). 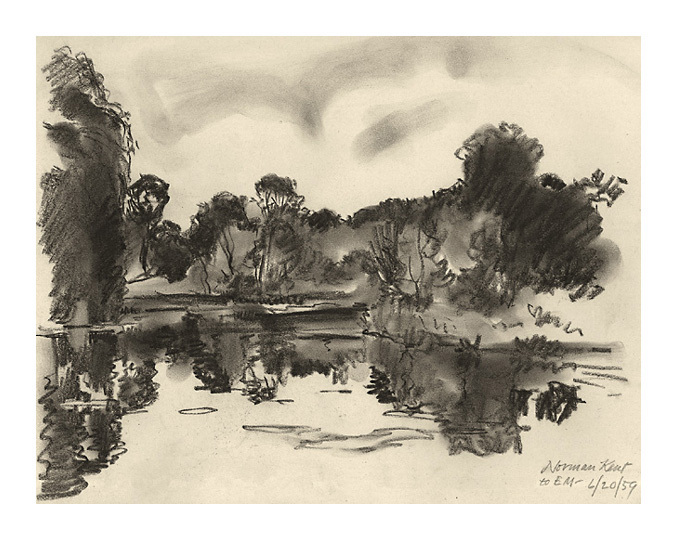 A fresh, gestural drawing, on cream wove paper, with full margins (1/8 to 1/2 inch); irregular left sheet edge, torn from a sketchbook by the artist; otherwise in excellent condition.